Every Baylor Bear knows the iconic Pat Neff Hall. It houses the highest offices at the university — including the president herself — and is no doubt one of the most photogenic buildings on campus. 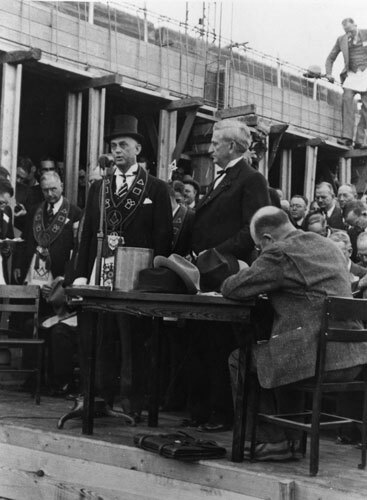 Eighty years ago today — Dec. 7, 1938 — the building was “born,” when the cornerstone was laid in a ceremonial event. Baylor’s enrollment at the time was booming, even amidst the Great Depression. This was great news for the university, but led to overcrowded classrooms and lack of faculty space. Thankfully, the General Education Board, a New York-based philanthropic organization dedicated to supporting higher education institutions, offered $50,000 for the construction of an administration building to free up classroom space. And so, construction on the new building — eventually named Pat Neff Hall, in honor of the president who saw the university through the country’s most difficult economic struggle — began, celebrated with the cornerstone-laying ceremony mentioned above. Designed by the Waco architectural firm Birch D. Easterwood and Son, the 46,000-square-foot, American Georgian-style building was completed in 1939 at a total cost of $250,000, and dedicated on the next Baylor Founders Day, Feb. 1, 1940. Inside, in the center of the first floor, you’ll find a 1939 version of the Baylor seal — then newly redesigned per President Neff’s recommendations. Designed by Baylor student Enrique Ramirez, the seal is now roped off to prevent further damage. At the top of the building was the hall’s original carillon, the Cullen F. Thomas Carillon. Installed at the end of construction, the chimes rang out for the first time on Dec. 21, 1939, with “Praise God From Whom All Blessings Flow.” Those bells would last almost 50 years before being replaced in 1988 with the current McLane Carillon. Today, Pat Neff Hall houses the offices of the president and provost, general counsel, internal auditing, academic ceremonies and facility planning, governmental relations, graduate professional research, the Institute for Studies of Religion, and performance space for carillonneur Lynette Geary and her pupils. Sic ’em, Pat Neff Hall!